Over 100 kid tested- whole food vegan recipes, by Dreena Burton. OVER 100 recipes. Part 1, there’s an intro to eating with plant power including Dreena’s story. A handy guide to what you should have in your pantry. And she talks about plant power batch cooking. I’m all for batch cooking. I know that I can go to my freezer and pull something out that’s healthful and not have to resort to some junky processed foods because I’m in a hurry. Sugar N spice cake pg 204, vanilla bean almond butter fudge pg. 197, no- bake granola bars pg, 190, “nicer” krispie squares pg. 186, natural berry jam pg. 179, chocolate chia pudding pg. 174, ultimate teriyaki stir fry pg. 166, tofu in cashew ginger sauce (I used the sauce over rice, but didn’t add the tofu- added chickpeas instead) pg.156, home fries pg. 152, balsamic glazed seasoned yam fries, mac-nificent pg.134, thick n hearty tomato sauce pg. 133, Creamy Fettuccine pg. 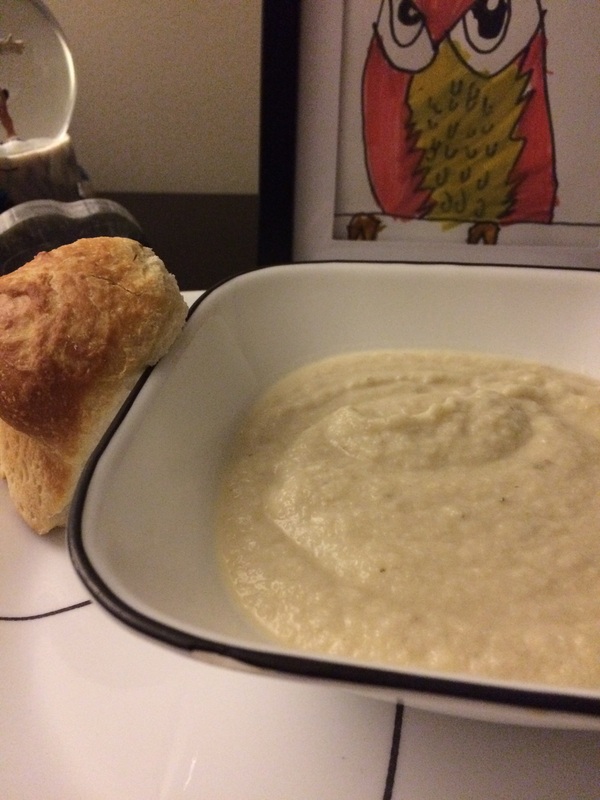 130, chick n rice soup pg. 126, sniffle soup pg.122, smoky bean chili pg.121, super cheesy sprinkle pg. 113, cheesy Caesar dressing pg. 106, red lentil hummus pg. 87, mild cheesy dip pg.83, chickpea nibbles pg. 77, chickpea salad pg. 64, apple spice hemp muffin pg. 52, best banana bread pg.48- just a few recipes that I have made. Click on the links for the recipes. Part 3, challenges and solutions. Dreena has 3 kids so I’m pretty sure at some point she’s had some challenges during meals. She talks about the 3 C’s: consistent, certain and calm. Don’t give up. She offers sound advice and handy tips to help avoid the dinner table looking like a battlefield. Stuff like how to involve your children, get them interested, how to make it interesting to them and some of the culprits that might causing the food fight. Who hasn’t had to face the “dreaded” bday invite? How should you deal with that? Without offending the host. Well there’s tips on how to handle not only that, but hosting your own plant power parties , with the most popular recipes kids love. Part 4: Support, including DIY staples, cooking guides, meal plans and FAQ’s. I love how wholesome the menu plan is. There’s a nutritional breakdown, so you know that you are providing your family with all the nutrients they need. She answers questions about protein, soy and so on. Has nutrient charts, did you know that 1/2 cup of brown rice has 2.5 g or 8% protein of calories? Now you do. I think this is a MUST have book for anyone that has children, or watches children. Or even for those without kids. What is your favorite Dreena recipe? Note* the pictures are from amazon.ca and contain affiliate links. I love Halloween, actually I love anything that involves parties and food. 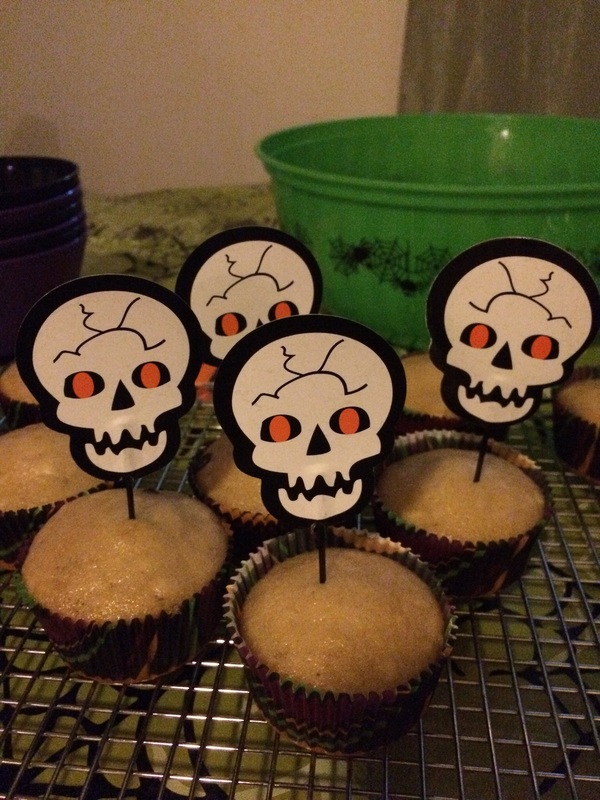 We celebrated Halloween on Nov 1, due to a personal choice. No, I didn’t take my kids out to knock on doors to beg strangers for candy that would still be around come Easter. Instead, I made some yummy food from Kathy Hester’s The Ghoulish Gourmet, So good- in fact, I’m cooking out of this book year round. Crackers can be shaped as anything you want them to be. The potato soup would work on St. Patrick’s day because it’s green (but seriously, I don’t think you need a reason to make this soup- just do it, your taste buds thank you) and the mummies- would be a great meal, paired with something light and fresh- like a salad. 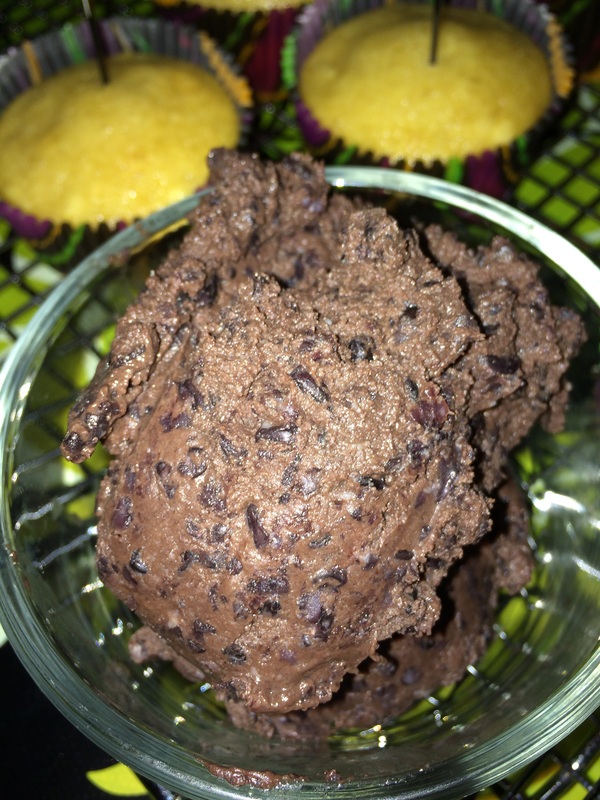 On Sat, I made Vegan Halloween Dessert: Gruesome Forbidden Rice Mousse. Rice and chocolate. Do I really need to say more? This is rich and sinful but oh so worth it! I didn’t let it cool down before eating a big spoonful of it. It’s not pretty to look at, but that’s the point- it was Halloween Baby!!!! 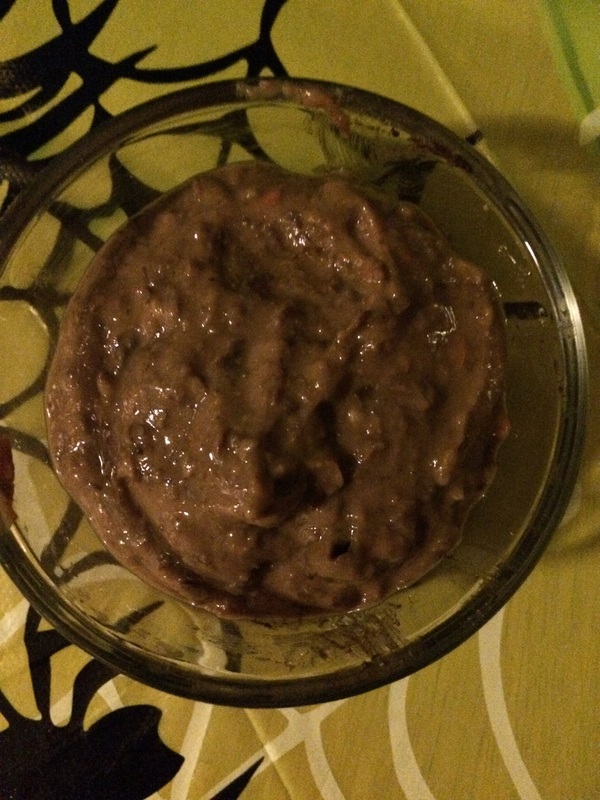 I also made Black of the night Black bean soup…. it’s cooked in the crock pot. It’s as simple as opening beans, and throwing some spices in. And the taste? It tastes like you slaved all day making it. Again, not pretty- but that’s the point 🙂 You can find the recipe in The Ghoulish Gourmet. 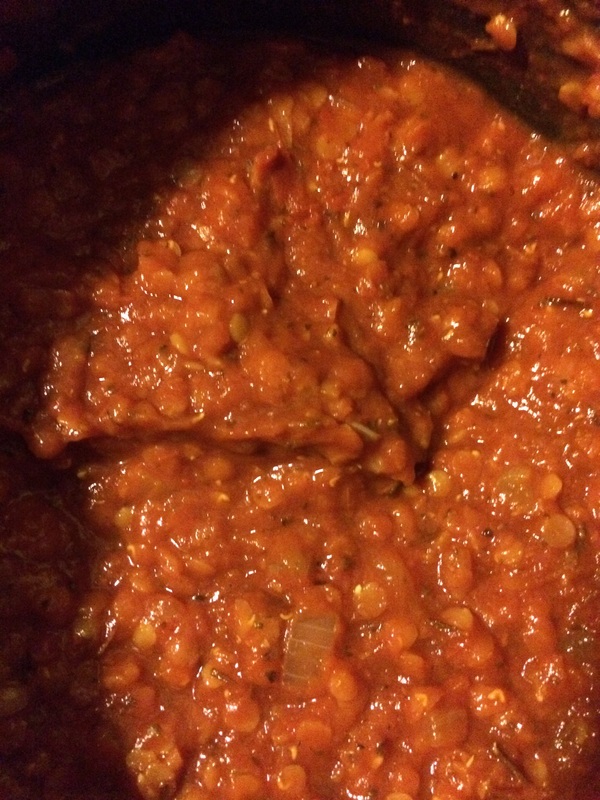 I also made Dreena Burton’s Hide the Lentils pasta sauce. (I’m going to be making the mummies again because they are really good.) This is my go to sauce. I’ve tried others, but this one is thick, hearty and leaves you wanting more. I highly suggest you eating it with some bread- garlic bread in fact, just so you can get every last bit of sauce off your plate. You can find the recipe on page 129 of Eat, Drink Be Vegan. How was your Halloween. What treats did you make? Or did you turn off all the lights, snuggle under the blanket eating popcorn and watching scary movies all night? There is just something magical about Dreena’s recipes. It’s like inviting an old friend into your home, there’s just comfort and a peacefulness about them. And this recipe is no different. This dish cooks in about 30 mins, it’s mild tasting, light yet filling- I love it with garlic bread or even buttered bread to get every last bit of it from the bowl. We’re classy like that.. don’t be using your tongue to lick the bowl. The recipe can be found on page 125 of her latest book Plant Powered Families. Tip of the day: I love storing left over soup in a mason jar.